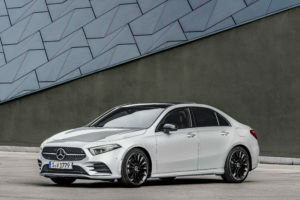 Mercedes on Thursday announced its next-generation 2019 A-Class Sedan incorporates more high- and ultra-high-strength steel within a design developed with help from its relatively new crash-test facility. “Every single body shell component was developed according to loads and stresses encountered, with respect to geometry, material thickness, joining technology and material quality (increased proportion of high-strength and ultra-high-strength sheet steel),” Mercedes wrote in a news release. Mercedes ought to understand collisions. The OEM said the A-Class was its first vehicle designed within the OEM’s Technology Centre for Vehicle Safety, which opened and performed its first “productive” crash test in 2016. The facility cost “a three-digit million euro sum,” Mercedes said in November 2016. That’d be about the same in dollars based on the exchange rate back then. According to Mercedes, it can perform 900 crash tests a year and another 1,700 sled tests — and it might be a tougher judge than external parties. “Mercedes-Benz has always conducted more and much more demanding crash tests than prescribed by legislation or required for ratings,” the OEM wrote in 2016. “Mercedes-Benz continues to work to replicate the way accidents actually happen even more realistically in its crash tests,” the OEM wrote. The largest pillar-free area of the “crash hall” is more than 295 feet by 295 feet, and the longest crash run is more more than 656 feet, according to Mercedes. The front seatbelts have force limiters and tensioners. A driver’s knee airbag is standard, the standard “window” airbags cover the A-pillars, and torso-pelvis side airbags come standard in the front and as a rear seat option. LED headlights are standard, and customers can purchase an optional LED Intelligent Light System that Mercedes said can automatically adjust itself and the individual LEDs for the traffic situation. “The daylight-color of the LEDs is easy on the eyes and positively effects concentration,” Mercedes also wrote. ADAS tech including standard autobraking. An option allows the A-Class “to drive semi-autonomously in certain conditions” and “see more than 1,500 feet ahead,” while Active Distance Assist DISTRONIC (it’s unclear if this is an option or standard) can predictively adjust the car’s speed when a turn is near. Opening the trunk by kicking your foot is an option. 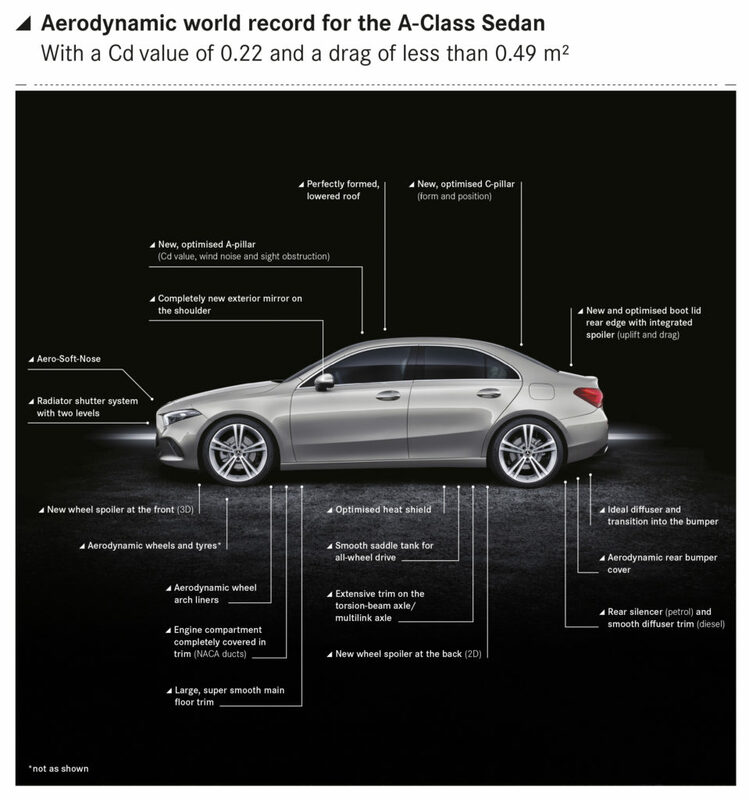 Check your exterior tolerances: “Clear, formal shapes emphasize surface areas with reduced lines and precise gaps,” Mercedes wrote. The radiator has shutters, the engine compartment is covered in trim from below, the bumper cover and tailgate are designed for aerodynamics as well.